Scenic routes were set by Ogden native Jeff Lowe, prominent climber who now is battling an illness. Al Hartmann | The Salt Lake Tribune Kevin Sweet celebrates after completing Route 2 at the via ferrata climbing area in Waterfall Canyon near Ogden. Via Ferrata (Italian for "iron road") is a mountain-climbing method that lets less experienced climbers enjoy the adrenaline rush and spectacular scenery usually reserved for elite climbers. Climbers are attached with a two carbiners on short leashes to a steel cable that follows the climbing route. Climers are alaway protected with at least one carabiner and leash attached to to the cable and If one should fall it would be a short drop to the next anchor point below. No ropes are involved. Conceived during World War I, via ferrata allowed Italian soldiers from the flatlands to move quickly through the mountains as they fought the Austrians for higher ground. 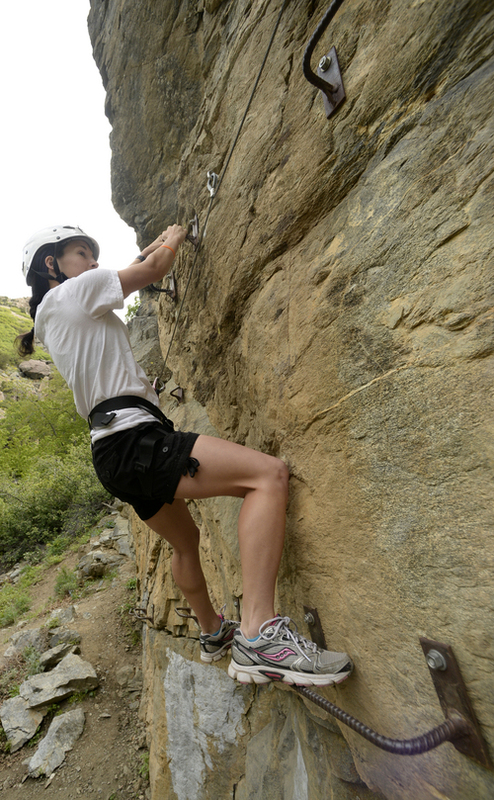 Al Hartmann | The Salt Lake Tribune Climbers participate in a "Via Ferrata" climb in Waterfall Canyon near Ogden. Via Ferrata, or "iron ladder," is a mountain-climbing method that lets less experienced climbers enjoy the adrenaline rush and spectacular scenery usually reserved for elite climbers. Al Hartmann | The Salt Lake Tribune Climbers participate in a "Via Ferrata" climb in Waterfall Canyon near Ogden. Via Ferrata, or "iron ladder," is a mountain-climbing method that lets less experienced climbers enjoy the adrenaline rush and spectacular scenery usually reserved for elite climbers. Al Hartmann | The Salt Lake Tribune Climbers participate in a "Via Ferrata" climb in Waterfall Canyon near Ogden. Via Ferrata, or "iron ladder," is a mountain-climbing method that lets less experienced climbers enjoy the adrenaline rush and spectacular scenery usually reserved for elite climbers. 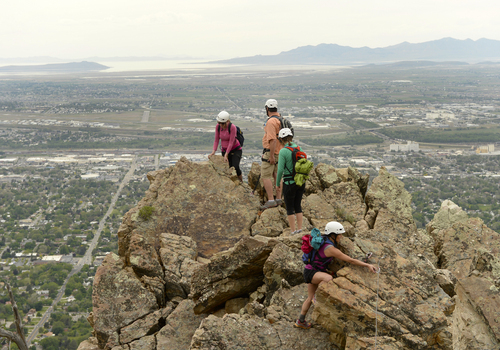 Al Hartmann | The Salt Lake Tribune Climbers participate in a "Via Ferrata" climb in Waterfall Canyon near Ogden. Via Ferrata, or "iron ladder," is a mountain-climbing method that lets less experienced climbers enjoy the adrenaline rush and spectacular scenery usually reserved for elite climbers. Al Hartmann | The Salt Lake Tribune Climbers participate in a "Via Ferrata" climb in Waterfall Canyon near Ogden. Via Ferrata, or "iron ladder," is a mountain-climbing method that lets less experienced climbers enjoy the adrenaline rush and spectacular scenery usually reserved for elite climbers. Al Hartmann | The Salt Lake Tribune Climbers participate in a "Via Ferrata" climb in Waterfall Canyon near Ogden. Via Ferrata, or "iron ladder," is a mountain-climbing method that lets less experienced climbers enjoy the adrenaline rush and spectacular scenery usually reserved for elite climbers. 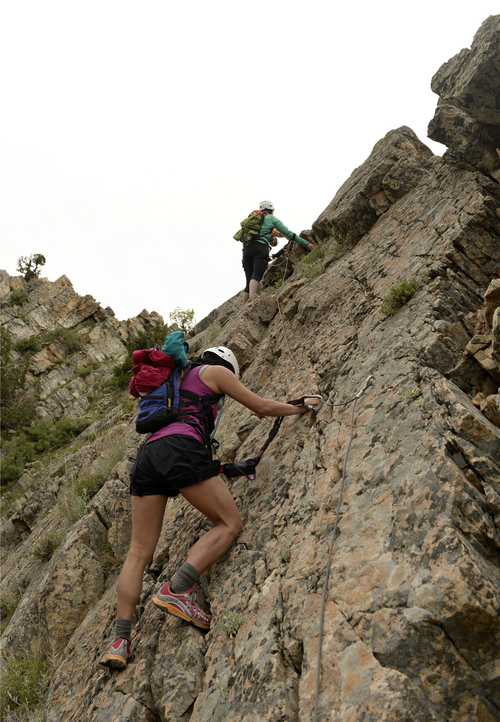 Al Hartmann | The Salt Lake Tribune Climbers participate in a "Via Ferrata" climb in Waterfall Canyon near Ogden. Via Ferrata, or "iron ladder," is a mountain-climbing method that lets less experienced climbers enjoy the adrenaline rush and spectacular scenery usually reserved for elite climbers. 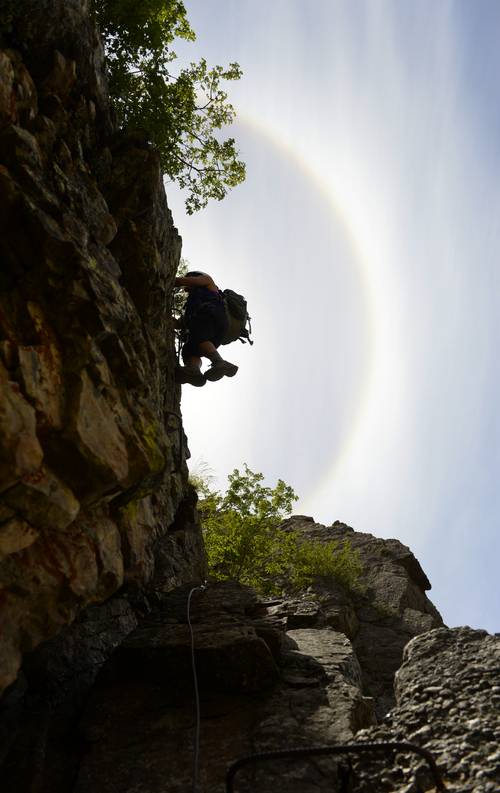 Al Hartmann | The Salt Lake Tribune Climbers participate in a "Via Ferrata" climb in Waterfall Canyon near Ogden. Via Ferrata, or "iron ladder," is a mountain-climbing method that lets less experienced climbers enjoy the adrenaline rush and spectacular scenery usually reserved for elite climbers. Al Hartmann | The Salt Lake Tribune Climbers participate in a "Via Ferrata" climb in Waterfall Canyon near Ogden. Via Ferrata, or "iron ladder," is a mountain-climbing method that lets less experienced climbers enjoy the adrenaline rush and spectacular scenery usually reserved for elite climbers. Al Hartmann | The Salt Lake Tribune Climbers participate in a "Via Ferrata" climb in Waterfall Canyon near Ogden. Via Ferrata, or "iron ladder," is a mountain-climbing method that lets less experienced climbers enjoy the adrenaline rush and spectacular scenery usually reserved for elite climbers. Al Hartmann | The Salt Lake Tribune Climbers participate in a "Via Ferrata" climb in Waterfall Canyon near Ogden. Via Ferrata, or "iron ladder," is a mountain-climbing method that lets less experienced climbers enjoy the adrenaline rush and spectacular scenery usually reserved for elite climbers. Al Hartmann | The Salt Lake Tribune Climbers participate in a "Via Ferrata" climb in Waterfall Canyon near Ogden. Via Ferrata, or "iron ladder," is a mountain-climbing method that lets less experienced climbers enjoy the adrenaline rush and spectacular scenery usually reserved for elite climbers. Al Hartmann | The Salt Lake Tribune Climbers participate in a "Via Ferrata" climb in Waterfall Canyon near Ogden. Via Ferrata, or "iron ladder," is a mountain-climbing method that lets less experienced climbers enjoy the adrenaline rush and spectacular scenery usually reserved for elite climbers. 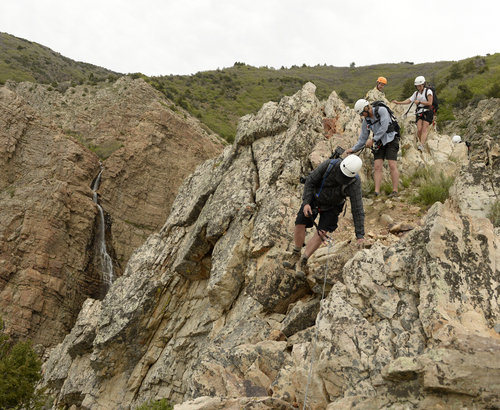 Al Hartmann | The Salt Lake Tribune Climbers participate in a "Via Ferrata" climb in Waterfall Canyon near Ogden. Via Ferrata, or "iron ladder," is a mountain-climbing method that lets less experienced climbers enjoy the adrenaline rush and spectacular scenery usually reserved for elite climbers. 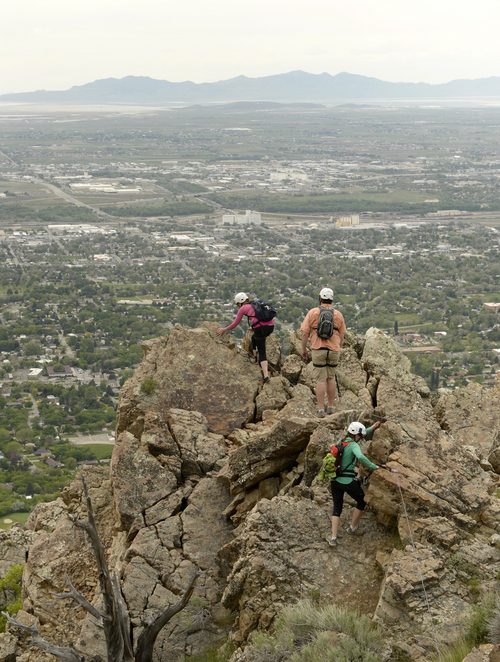 Ogden • Jennifer Bordner is not a rock climber. In fact, she gets a little nervous just climbing a ladder. 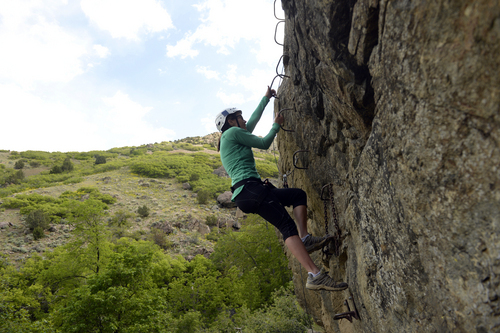 But the Sandy resident recently climbed a technical route in the Ogden foothills set by one of the world&apos;s most recognized climbers and she did it without slipping or getting stuck in a precarious position. 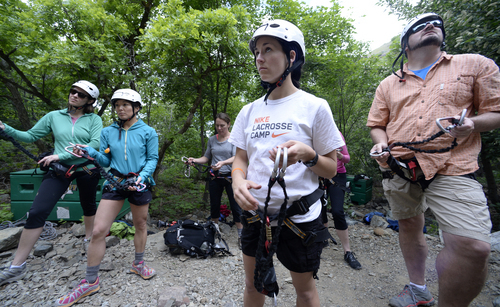 "It was incredible; really, truly incredible," Bordner said after completing her first assisted climb at the Waterfall Canyon Via Ferrata climbing center. "I feel like I have accomplished something I never would have accomplished." 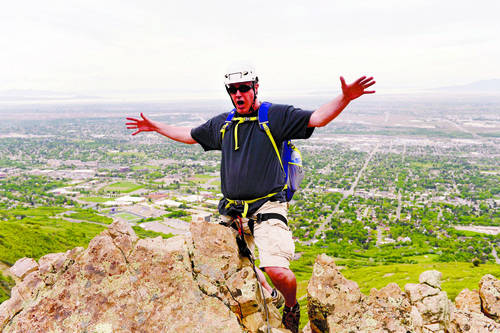 The route was established by Ogden native Jeff Lowe, who first climbed the rocks east of town as a 6-year-old. Lowe went on to complete more than 1,000 first ascents, many of them solo, tackling some of the trickiest natural climbing walls on the planet. Today, Lowe can&apos;t muster the strength to climb out of a wheelchair, and that&apos;s one of the reasons Bordner decided to make her first attempt at rock climbing. Lowe, 63, started having health issues 14 years ago. His balance and coordination deteriorated and, after being told he had several other diseases, he received a final diagnosis of "an unknown neurodegenerative process" similar to amyotrophic lateral sclerosis (ALS). Bordner had never considered climbing and had never heard of Lowe, but she was all too familiar with ALS, endured by her husband&apos;s mother. "I wanted to do [the climb] initially because I thought it sounded fun," Bordner said. "When I heard the backstory and how Jeff Lowe had been involved I thought it would be a nice tribute to [my husband&apos;s] mother. I wish I could meet him. He is so inspiring to so many people." Lowe was already losing his famous scaling skills when Chris Peterson asked the famed climber if he would like to return to the foothills of his childhood and help create the Waterfall Canyon Via Ferrata climbing center. Via Ferrata, which translates as "iron road," was started by Italian soldiers in World War I as a way to move troops quickly and safely to strategic high points in the mountains. Iron steps  picture rebar in the form of a wide U  are embedded in the rock and safety lines for climbers to clip onto are secured along the route. Peterson tried Via Ferrata during European trips he made for Snowbasin to visit ski chairlift companies in Italy and Austria. Peterson now owns the property where Waterfall Canyon is located and decided to create a Via Ferrata training wall and three climbing routes. Construction started in 2005 and was completed in 2006. "At first he was resistant, but he said he would think about it," Peterson said of the discussion with Lowe. "But, frankly, I think his sensitivity to climbers of a lesser ability, which is everyone other than Jeff, has been increased because of his illness." Lowe agreed to set the routes and woke up daily at 3 a.m. to make it to the top of the mountain by sunrise via a backside trail. He then rappelled down the face of the mountain to study routes. "He did a masterful job laying out these routes," Peterson said. "He was truly in his element. He takes us around corners into little overhangs where suddenly you have no choice but to see a beautiful set of bright green or red-orange lichen. Then you come around another corner and you bang your head and it makes you turn and look out at the Great Salt Lake." 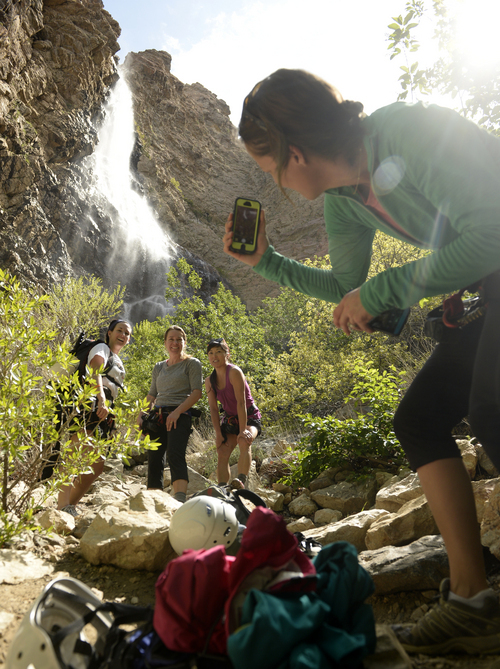 A massive waterfall provides the perfect backdrop for climbers to take selfies or have a friend snap a shot on all the routes. 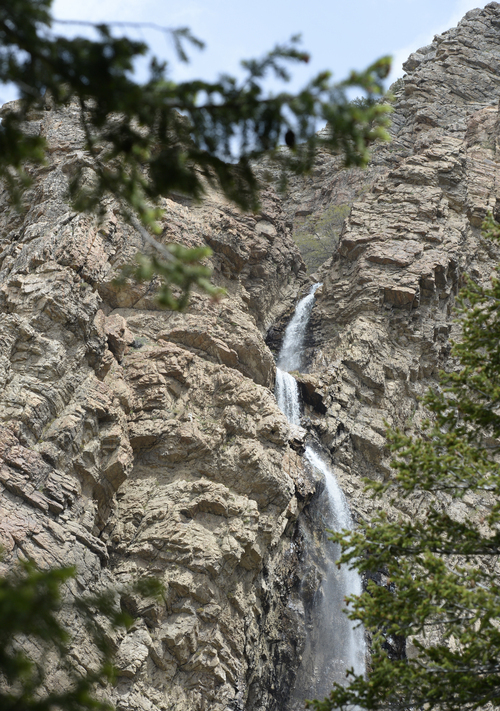 Peterson says anyone who can "climb a ladder and go on a 2-mile hike" can climb at Waterfall Canyon. More experienced climbers are invited to clip on the safety lines and climb the same routes without using the iron steps. For those in the know, Route 1 is rated a 5.6 with a 5.7 crux, Route 2 is a 5.8 climb with a 5.10 crux (there&apos;s an upside down stretch) and Route 3 is rated 5.13. "No one has ever climbed Route 3 without touching the rungs," Peterson said. "We are waiting for that person." 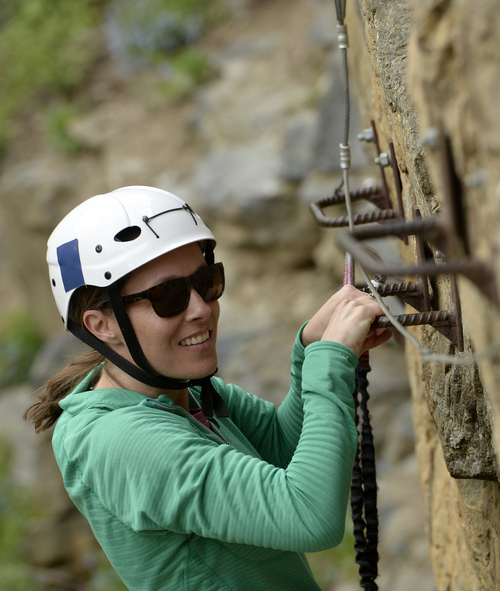 Idie Atencio admits she was a little anxious about her first Via Ferrata experience, but the apprehension she felt on the training wall quickly dissolved when her group started Route 2. 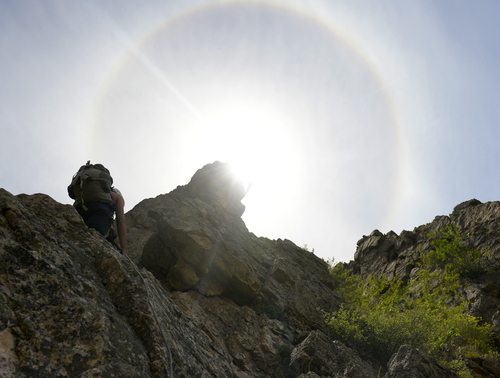 "I was looking up and thinking, &apos;This is kind of a serious climb,&apos; but once we got climbing it was more about it being such a cool hike and looking around because it was so beautiful," Atencio said. "I felt completely safe and I have a whole new respect for rock climbers who just stick their fingers in the cracks and find their way. For a second in the beginning I thought maybe I wanted to be a rock climber and then I realized I&apos;d only like to be a rock climber with help." Atenico, Bordner and Dawn Cardinale all enjoyed the social aspect of Via Feratta climbing. 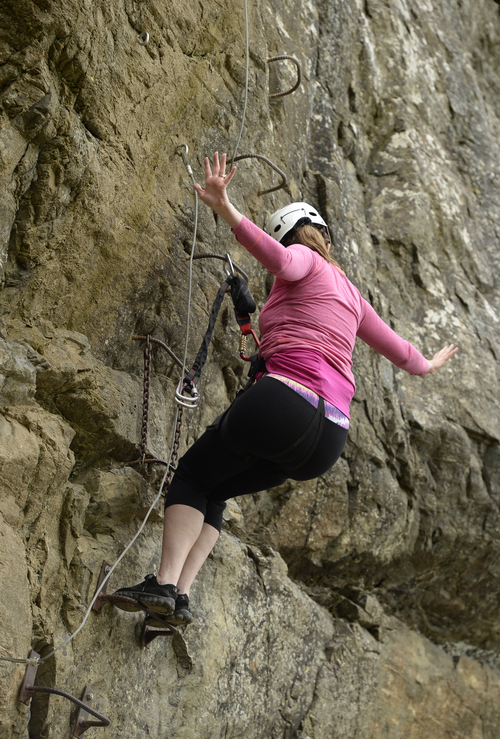 Climbers can be within talking distance between safety lines and can provide encouragement along the way. "In traditional climbing climbers are at the opposite end of long ropes shouting at each other," Peterson said. "With Via Ferrata people can talk to each other the whole time." Guides at the park say it is fun to watch groups and families bond during their climb. 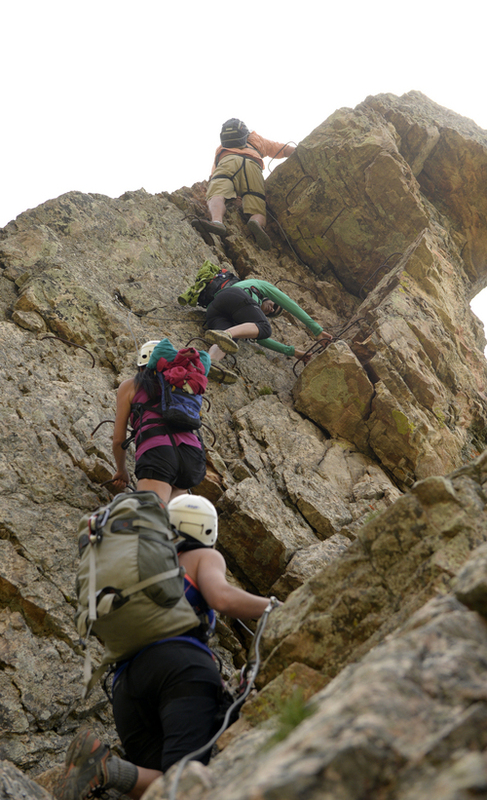 "We found the climbing is especially memorable for families on national park tours where they are spending a lot of time in the car and maybe there is a little tension between mom, dad and the kids," he said. "Teenagers cooped up in cars sometimes like to hang upside down and say, &apos;Look mom, no hands, no feet, take my picture.&apos;"
Bordner&apos;s determined climb up Route 2 was a different kind of family outing. While crawling over ridges and stepping into thin air to find an iron step she felt the presence of the mother-in-law she never had the opportunity to meet. She found strength thinking of the countless hours her husband, Jeff Bordner, spent caring for his mother. Inspiration came from knowing she was climbing a route picked by one of the best alpinists in the world, now unable to make the same journey. Perhaps most importantly, Bordner realized how thankful she was to be able to physically make the climb on her own. "I am grateful I can walk and climb and that I can talk," Bordner said. "It does motivate me to try. If you put your mind to anything you can accomplish it. I&apos;m a big believer in that. You put out into the universe what you want to get and it will come back to you." Check out the bucket list&apos;s Facebook page  http://www.facebook.com/UtahBucketList  or follow @UtahBucketList on Twitter and tell us what&apos;s on your list of things to do in this life.